“Vincent, that’s stupid talk” – Sean Quinn rejecting suggestions that artificially low insurance premiums caused the problems at Quinn Insurance. 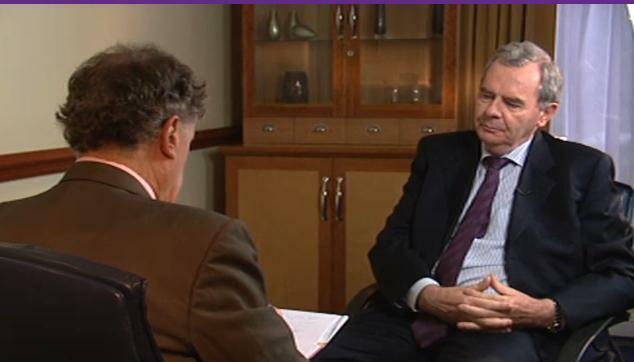 Vincent Browne interviews Sean Quinn for Tonight with Vincent Browne, broadcast on TV3 in July 2012. There is an unfolding financial scandal at Quinn Insurance that has been largely overlooked until recently, and this is a bit of an “Idiots Guide” to what has happened, what it means for the economy and what it means to you. Yesterday in the High Court, the joint administrators for Quinn Insurance gave a report on their work and alongside the Central Bank of Ireland, provided an upper estimate of the cost of bailing out Quinn Insurance at €1.65bn although the more likely estimate is €1.1-1.3bn – though on the other hand, it was made clear that the €1.65bn “upper limit” might itself increase, and given our recent history with bailing out banks, we can’t be blamed for getting that sinking feeling in our stomachs that this cost may rise. A potted history of Quinn Insurance. Sean Quinn senior’s early businesses have been well-documented, he started with the family quarry in the 1970s and grew an enormous empire that made real products, mostly for the construction industry. In 1996, Quinn Financial Services was founded and with that Sean Quinn entered the insurance market where his company was, in the usual Quinn fashion up to then, highly successful, turning in decent profits and grew to become Ireland’s second biggest insurer by 2008, and by 2008 the insurance business was generating half of Quinn’s total revenues. The Quinn family controlled the company. The UK operation was launched in 2000. In 2007 the company made a €76m profit. In October 2008, the Financial Regulator Patrick Neary fined Quinn Insurance and Sean Quinn senior personally a total of €3.45m for having inappropriately transferred funds from Quinn Insurance to another Sean Quinn company, Barlo – this remains a record fine in Ireland. And at the same time, Sean Quinn stood down as chairman, though he and his family retained control of the company. 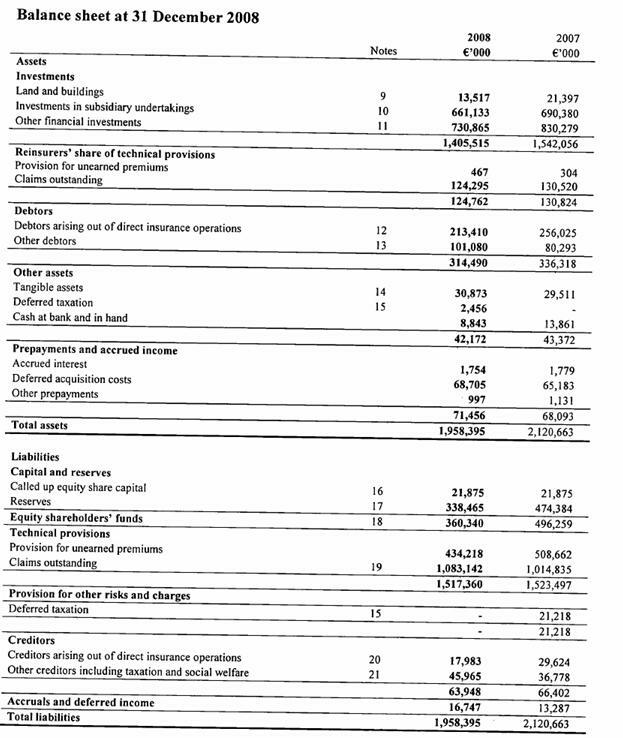 In 2008 the company posted a €125m loss. In 2009 the loss rose to €706m. 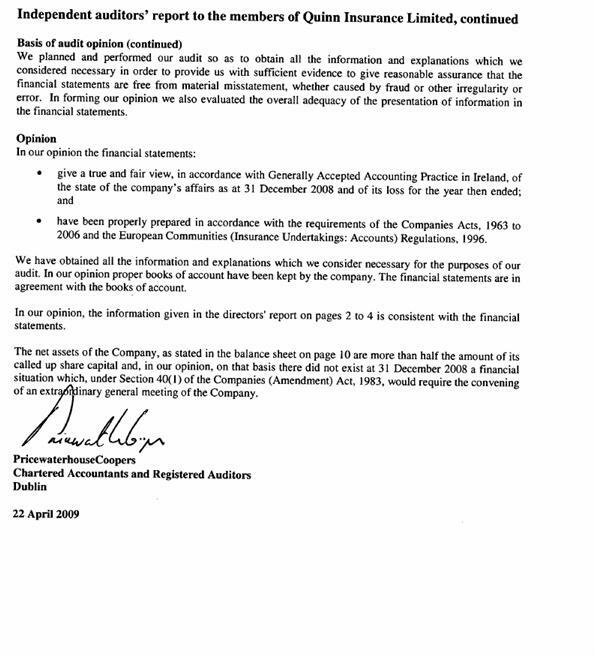 In March 2010, the current Financial Regulator, Matthew Elderfield had Michael McAteer and Paul McCann from Grant Thornton appointed as joint administrators, citing as the reason for his action in the press release “the interests of the firm’s policyholders” Matthew Elderfield was reported to have said that “the strength” of Quinn Insurance had been overstated by €450m and for the first time, the prospect of an insurance levy on consumers was mooted. In 2010 the company lost €160m. Why do we bail out insurance companies? The Government acts as a backstop guarantee to cover all insurance claims for risks in this State. And until the end of 2011, it acted as a backstop guarantee for insurance policies written by Irish insurance companies in other states – that’s why we are on the hook for the UK liabilities at Quinn (see below). Why does the Government guarantee the finances of some businesses like banks and insurance companies, but not others like shops and factories? Mostly because these businesses depend on consumer confidence, the confidence to place money on deposit with banks, the confidence to expect a payout on your claim at an insurance company. The Government has created a fund, called the Insurance Compensation Fund (ICF), under the Insurance Act 1964, the purpose of which is to protect policy holders in the event of their insurer becoming insolvent. It is an industry financed fund. However because the scheme is not pre-funded, the Government advances monies on the recommendation of the Central Bank in circumstances where insufficient funds have been generated by an industry levy to cover a large demand. Is this normal, how do other countries deal with insurance losses? It is not unusual for the governments to backstop guarantee insurance companies. And if that capitalist superpower the USA can bail out insurance company, AIG, to the tune of USD 170bn, then you can bet that our model is not unique. Who is to blame? The primary culprit for losses in any business is the owner, and until March 2010, Sean Quinn was, for all intents and purposes, the owner though he stepped down as chairman in 2008. But if the losses were only booked after 2010, how can we blame Sean Quinn? Remember, the insurance business works with you paying a premium upfront and then there being subsequent claims – if the company is well run, then the premiums received will exceed the subsequent claims, it’s not rocket science! But there can be a considerable lag between paying the premium and receiving the compo. So you might purchase car insurance in March 2008, have a crash in December 2008, but between assessments and negotiations, it might be 2011 when you get you pay-out. In addition to the business owner, we might have cause for grievance against the auditors, PwC and the actuaries, Milliman. And at the official level, we might wish to vent our unhappiness (again!) at the former Financial Regulator, Patrick Neary. These billions being talked about, is this real money? Oh yes, the Government gave a loan of €280m to the ICF in 2011, and so far this year, has given an additional loan of €450m – that’s €730m to date, and it looks set to loan another €0.4-1bn. It is getting this money from the usual sources – taxation and borrowings from the Troika. The Government will be repaid these loans with “a commercial rate of interest”, courtesy of YOU! What is this going to cost me? With the exception of life assurance, the 2% levy will apply to all other insurance policies from all insurers covering risks in Ireland, and that will include motor and home insurance. If the size of the non-life insurance market in Ireland is €4bn per annum, then to recoup €1.1bn with a 2% levy, implies we will be paying for 13.5 years at constant prices. If the final cost of the Quinn debacle is at the higher end estimate of €1.65bn, then we will be paying for 20 years at constant prices. Minister Noonan indicated in April 2012 that his forecasts were of a total annual levy of €65m which would indicate the Quinn misery lasts 17-28 years. Insurance premiums will rise of course – with inflation, if with nothing else, but unfortunately we also need pay “a commercial rate of interest” to the ICF which will offset the inflationary increase. The cost to you will be a 2% levy which is surcharged on your insurance premium so an €800 car insurance premium will cost you €816. A €500 Home and contents insurance premium will cost you €510. Haven’t I been paying a levy all along? No, last year you will have paid a 3% stamp duty fee and that is different to the levy; the stamp duty fee goes directly to the Exchequer. This 2% levy that is now being talked about, is different, and extra. So now you’ll be paying an overall total of 5% to the Government on every non-life insurance policy, of which 2% is to pay for Quinn Insurance. Where is the political oversight? Well the Irish finance minister up to May 2008 was Brian Cowen who later became Taoiseach and then disappeared from the national stage in January/February 2011 when Micheal Martin took over the reins. The late Brian Lenihan became finance minister in May 2008 and was at the helm when irregularities were uncovered and when administrators were appointed, and of course Michael Noonan has been at the helm since March 2011. There is little evidence of the “players” being called to account, though the administrators did launch legal action against PwC in February 2012 (High Court reference 2012/1540 P) but there has not been any development in that case yet. The Irish Times today reports “in June , Noonan asked the administrators to keep him appraised on whether there is “right of legal action for professional negligence” against Quinn’s former auditors PricewaterhouseCoopers and the company’s “signing actuaries”, Milliman” But we have seen in recent Dail exchanges that Minister Noonan is not at all keen to cross swords with audit firms and others who seemingly played a major role in the 2008 crisis which has led to a €70bn bank bailout. Remember there used to be a company once called Arthur Andersen but it imploded in the aftermath of the Enron scandal. There doesn’t seem to be any official appetite in this country to test the professional indemnity insurance of auditors and others whose standard of work is suspected of contributing to the crisis. Has this ever happened before? Oh yes, twice. Remember PMPA, the motor insurance provider founded in the 1960s by Joe Moore, which went bust in 1983 leaving us with a €10m – yes, a paltry ten million – bill. Then there was the AIB unit, the Insurance Corporation of Ireland which needed a bailout in 1985 and cost us just over €120m. If you were around, you will have been paying a 2% levy between 1984 and early 1990s to fund these two particular messes. But with a combined total cost of less than €150m, these two bailouts were peanuts compared with the mess today at Quinn. Could it happen again? Yes. Unfortunately. Under normal circumstances you would expect a properly-run and regulated insurance company to have enough reserves to meet expected claims. But if we get unexpected disasters, like freak weather for example, then a future government may need bail-out another insurance company. That’s why insurance companies are subject to official regulation and what should be intrusive auditing and actuarial forecasting. In the case of Quinn, it seems that the investments made with the insurance premiums, performed very badly indeed and it is not clear how Quinn was allowed invest in what will have been less than blue-chip investments, or in related companies. I welcome Minister Noonan’s comments that he is “at a loss to see how such a large underestimation, and the corresponding scale of what is required from the Insurance Compensation Fund (“ICF“), could not have been foreseen to a greater extent before now” and that Irish Government was “misled”. “I have said all along that Quinn Insurance (the “Company” or “QIL“) was placed into Administration unnecessarily and on the basis of incorrect assumptions relied on by the Regulator, regarding the effects the Quinn Groups guarantees had on the solvency position of QIL. These guarantees were in place since 2005, were signed off by Auditors and were historically viewed as having no effect whatsoever on the solvency position of the Company; this was the appropriate treatment of the guarantees and has since been verified by legal opinion. The reality is that the Company was outperforming all its competitors immediately prior to being unnecessarily placed into Administration with the incalculable damage being inflicted thereafter. Since 2008, the Company, under the newly appointed board as agreed with the Regulator, continued to perform remarkably well. Despite the recession, the first quarter of 2010 was one of, if not the best quarter, in QIL’s history. In this quarter the Company reduced its claims by more than 2,800 and increased its cash position by 20 million Euro, which left QIL with an average reserve of more than twice the industry average, not to forget the 2,500 jobs that the Company was sustaining. The figures purportedly required by the Administrators from the ICF are truly shocking. The Court and Dept of Finance should seek further information on how they arrived at this astronomical figure, as even according to the Administrator’s own figures produced in March of this year; the Company had a loss ratio of 75.09% between 2004 and 2008, with only 2,593, claims remaining open for this period, therefore any suggestion that QIL was not profitable are completely unfounded. Furthermore, the Company has been settling circa. 95% of its claims within the first 12 months and a further 45% of the balance the year after, leaving only a small percentage of claims open after two years, so any suggestion that the previous management where underproviding for claims are groundless. However, as is clear from Minister Noonan’s statement we were not the only ones ‘misled’.